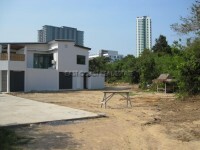 Located within one of South Jomtien’s premier estates is this great residential development site. There are 3 plots remaining and each is ample to build any fantastic luxury home with enough space even for a private swimming pool if desired. The village environment feels very safe and there are plenty of professional ex-pat families as neighbours. This area of South Jomtien is seeing a lot of development now with plenty of local businesses popping up along the Sukhumvit highway and the beautiful coastline. A small clean, secluded beach is just a 5 minute walk away from this plot and the view back across the skyline to the city is very dramatic. The title deeds for these last 3 land plots are held in a Thai name ownership and can be easily transferred. Each plot has full utilities and services, plus each has a perimeter wall and the land has been filled ready to build on.